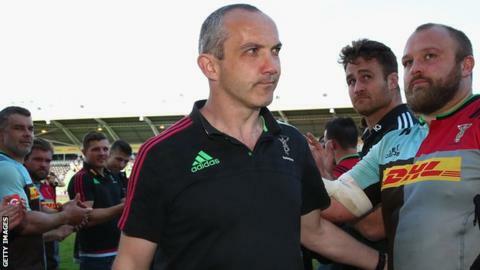 Harlequins number eight Nick Easter says the players want to win the European Challenge Cup for outgoing director of rugby Conor O'Shea. Quins face French side Montpellier in Friday's final, which will be O'Shea's last game before he joins Italy. "There are many reasons to perform and win on the weekend and he is certainly one of them," Easter, 37, said. "If we can bring a fourth trophy in six years that's an incredible time Conor has had here and we have had with him." O'Shea guided the south-west London side to Challenge Cup success in 2011, the Premiership title in 2012 and LV= Cup victory in 2013. The Irishman was denied a winning send-off in his final game in charge at The Stoop, as Quins were beaten 62-24 by Exeter Chiefs last Saturday. "It was sad last week, doing a lap of honour for him, given what happened," Easter told BBC Radio 5 live. "That is no way to send off someone who is going to be in the annals of history as far as Harlequins is concerned - the only man to bring us the English championship. "We owe him, with the success he has brought in the last six years." Harlequins are bidding to win their fourth Challenge Cup title, having previously won the competition in 2001, 2004 and 2011 - with all three victories coming against French opposition. Having finished only seventh in the Premiership, beating Montpellier would give the club a place in next season's European Champions Cup. "We didn't finish the season the way we wanted to in any way shape or form," O'Shea said. "Earlier this season we were playing some outstanding rugby. Sport gives you a chance for redemption we want to finish with that emotional high." The 45-year-old said he had "loved" his six-year spell with the club. "This place has given me more than I have ever given to it," he added. "I wouldn't change anything. This club will thrive and hopefully I have played a part in the history of this club." Experienced fly-half Nick Evans has recovered from a broken leg suffered in February to be fit for the final, and has urged his team-mates to seize the opportunity in front of them after an "embarrassing" showing against Exeter. "We owe the fans a lot after a performance like that," the New Zealander told BBC Radio London. "These chances don't come around too often. For all the Tests [Wales and British & Irish Lions prop] Adam Jones has played, he's never been in a European final. "You want to make the most of it." The 35-year-old added: "You look at how Man City went about their European semi-final with Real Madrid and they didn't really fire any shots. "If we can put on the pitch everything we are about - which we didn't do anything of last week - and impose our style, then we can hold our heads high afterwards."